If you live in a city like Los Angeles, having a car is almost a requirement. 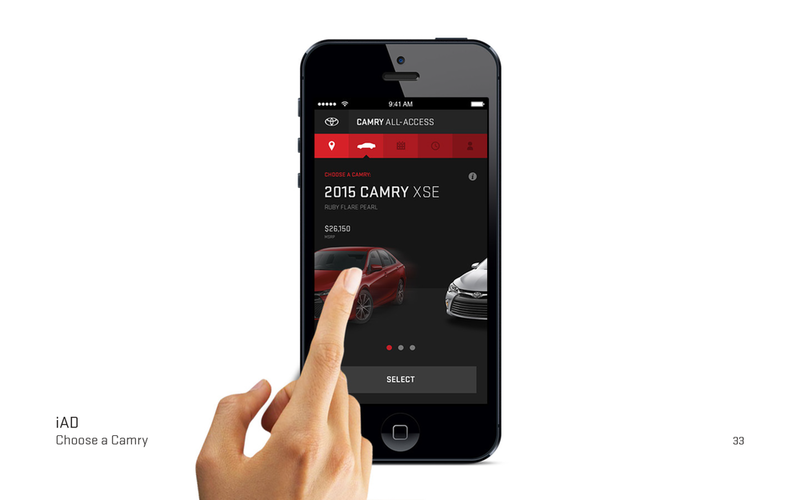 How was your last car-shopping experience? Did it cause anxiety? Stress? Even dread? While doing research for the responsive redesign of Toyota.com, we uncovered some unexpectedly visceral emotions from our customers when asked to speak about their past experiences with car shopping. In one instance a lovely man, who we’ll call James, was in search of a new vehicle after his was totaled. When the test drive was over, he wanted to go home and think about his options. The salesperson (not a Toyota salesperson, mind you) wanted to go into the finance manager’s office, despite James’ protests. James’ car keys and driver’s license were being held by the salesperson, who refused to return them until James agreed to go inside and discuss purchase options. James became emotional, feeling trapped and betrayed, and walked down the block to call a friend to come help him out of this situation. While we understand that this was an extreme case, the fear that James carries with him about going to a car dealership is a common one. When you’re making one of the largest purchases of your life, you often have only 10 or 15 minutes to test drive a vehicle to see if it’s a good fit. 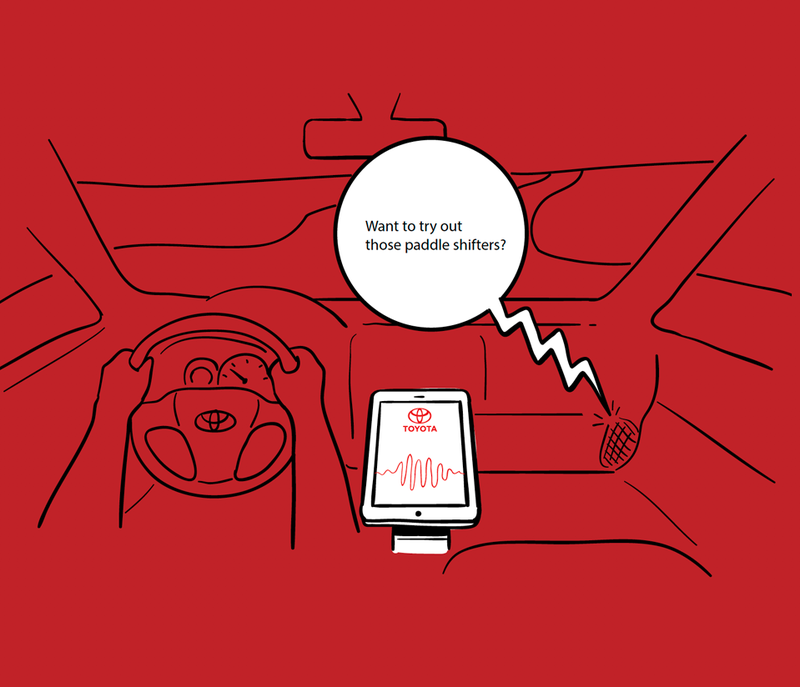 We also learned that some of the most frequent questions to Toyota’s call center related to in-car technology. How would we help mitigate both of these pain points? 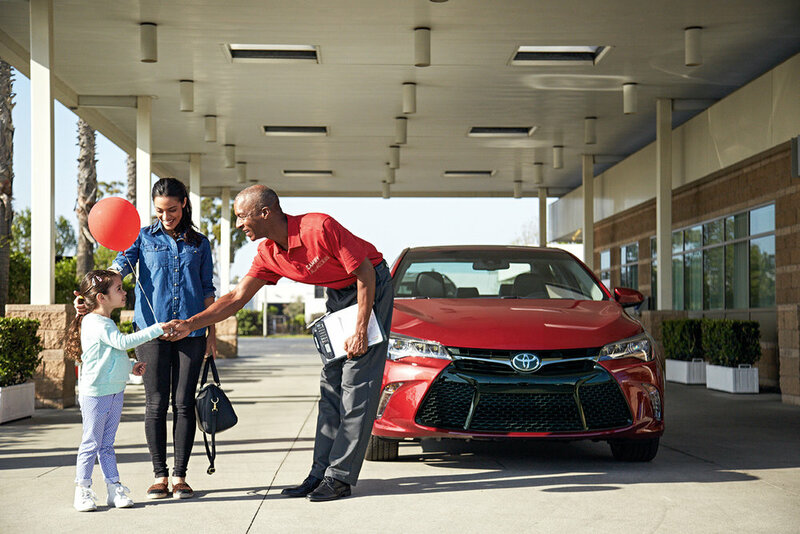 Our goal with Camry All-Access was to create a test-and-learn program to allow customers to have 24 hours to experience the vehicle and its technology at their own pace, without pressure from a salesperson. 2. The pick-up experience, whether in-dealership or somewhere else. What does that interaction look like to create minimal stress? 3. What’s the in-car experience like? How can we make that more engaging and educational? 4. What’s the drop-off experience like? How do we ensure the customer doesn’t feel any pressure or anxiety? How do the customers learn about the program? 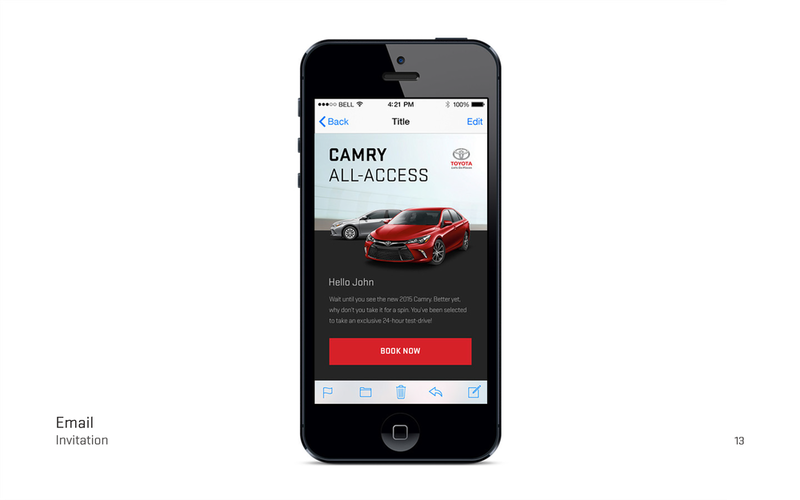 We targeted in-market shoppers by iAd, banners and emails and drove them to our responsive microsite to learn about the program. Clear way-finding and a knowledgable, friendly concierge-type representative to assist the customer to create a seamless, no-pressure pick-up experience. 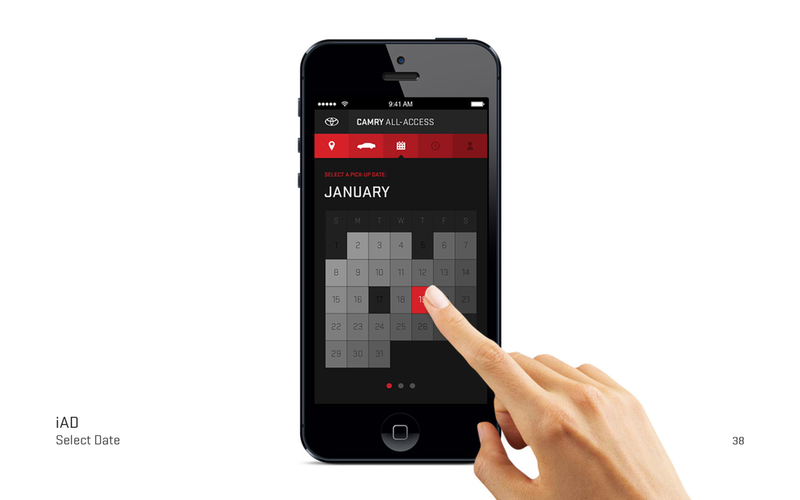 Set fun routes for the customer to fully experience what the vehicle has to offer. How about a drive in the canyon to test handling ability and unlock achievement badges to redeem for your favorite coffee beverage or drive-through treat? This is a critical element to the program. It had to be easy to use, while providing a strong value proposition to the customer. Is this “too good to be true?” Would they trust us? To keep the test drive from falling off their radar, there would be calendar/passbook integration. 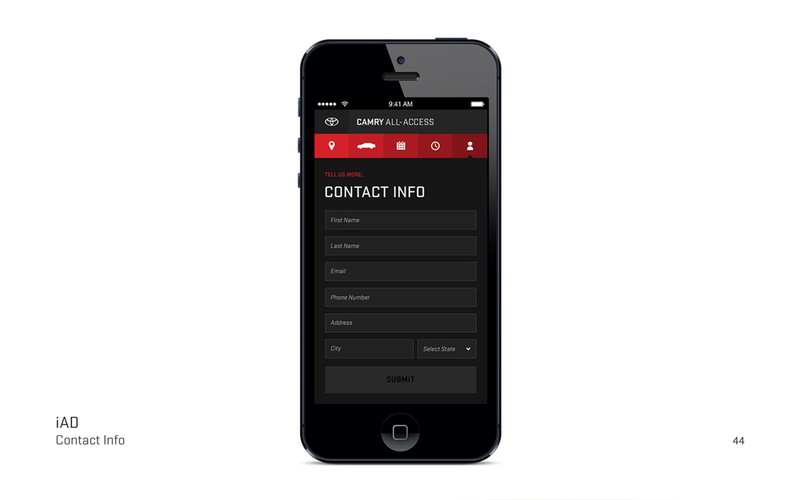 An iPad or similar device will be mounted in the vehicle to help educate the customer about the in-car technology. It will prompt or caution the driver, when appropriate and safe. 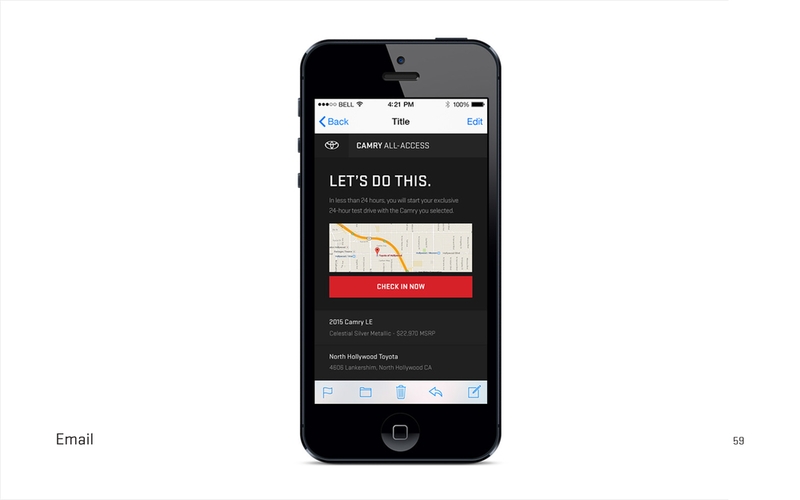 Document the drive and share your stress-free, no-strings experience. Return the vehicle to the dealership and ask any outstanding question or just hand-off the keys and bounce. These 24 hours were all about you. If you loved the car, great! If not, that’s ok, too. We started with a blue sky approach and slowly whittled our ideas down into an MVP. Without compromising the customer experience, what would be the quickest way to get to something meaningful for our customers, without causing friction for our dealer partners? There were existing technologies, platforms and infrastructure we could potentially plug-into for the sake of this program. 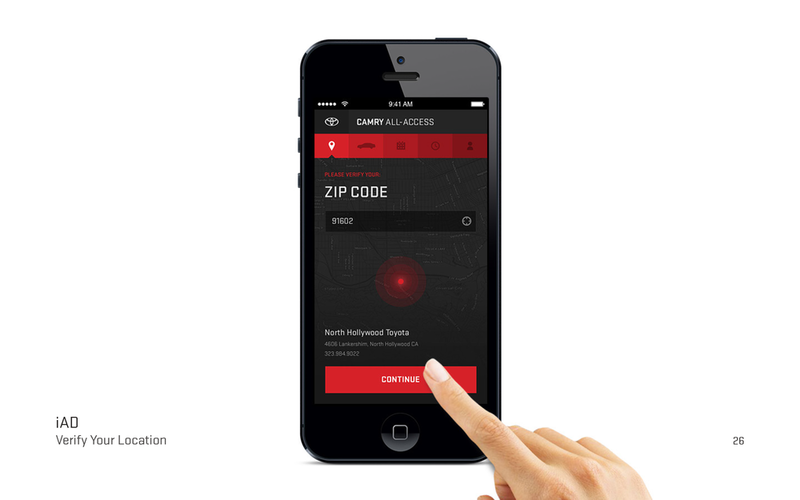 We also knew that by piloting in select markets, we would be able to geofence the experience based on zip code. Initially, we thought of touting this experience as “VIP” or like winning a “golden ticket” ala Willy Wonka, but we didn’t want to create unnecessary barriers to entry by promoting some false sense of entitlement. We wanted the experience to feel accessible to everyone. 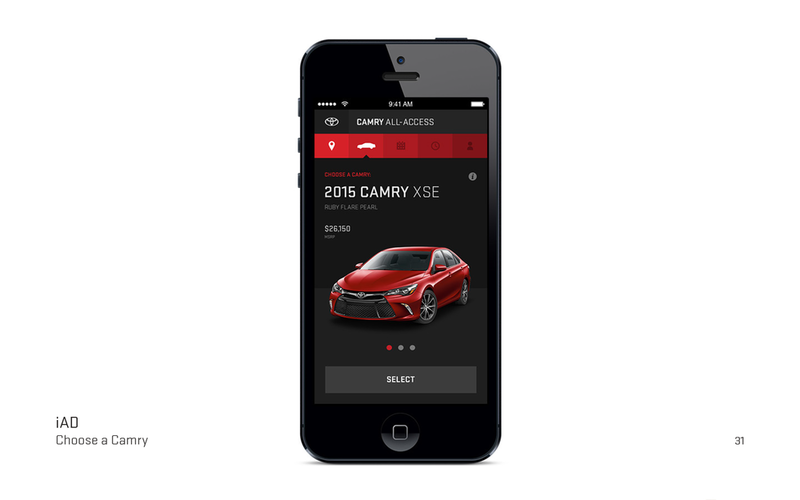 We considered creating a dealership-free experience for maximum reduction of customer anxiety and looked at services like Zipcar for inspiration. We also considered the use of beacons with RFID and NFC that could connect with Passbook to remote unlock a vehicle for the reservation holder. 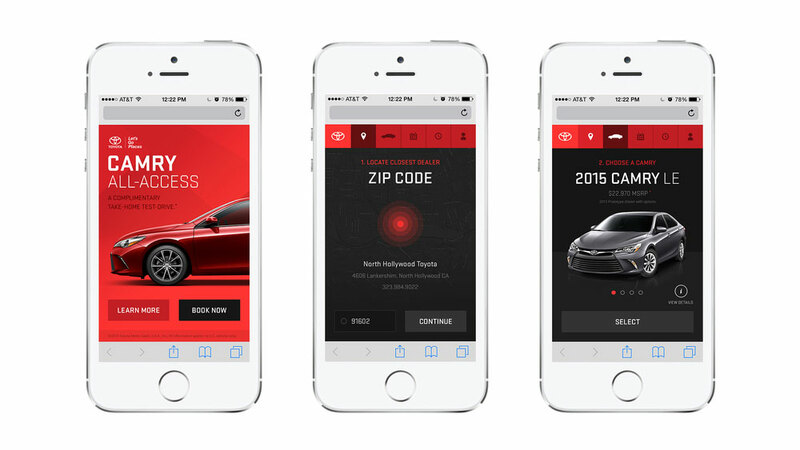 In the end, for practical reasons and to achieve our MVP, we had to utilize dealership property for the program. But we were able to selectively choose our pilot dealerships based on their comfort with new programs and openness to staffing the program with concierge-type partners rather than salespeople. 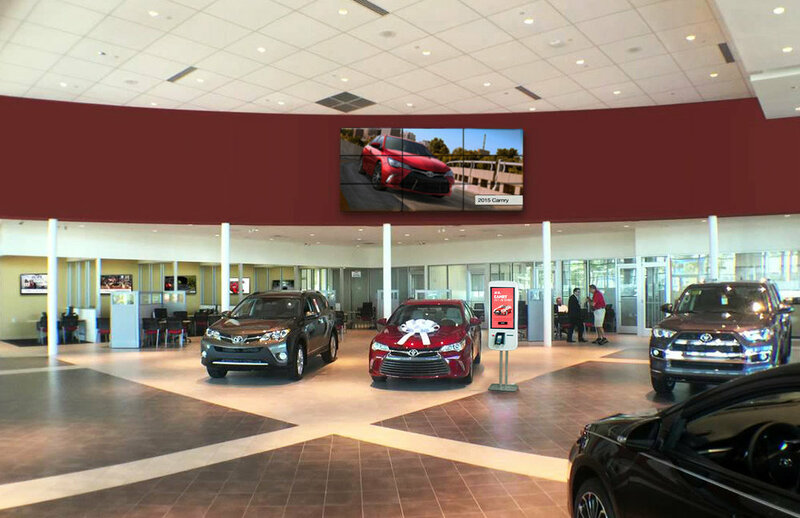 We also needed to ensure the physical layout of the dealerships would facilitate that separation between test driving and shopping. We didn’t want our customers to accidentally get routed away from the test drive they had reserved. The first pass at what this is going to look like and how we’ll effectively communicate the value proposition to the customer. How do we convey that this is really a free service to them without bogging them down in fine print? Building out the flow and wireframes, then moving quickly to a high fidelity prototype was key to get our dealer partners to buy-in to the program. With buy-in and support from five “Trailblazer” dealers across Southern California, we had to conduct site visits to determine the best use of space and plan for customer flow, signage and way finding. Every dealership is unique and, therefore, each presents unique challenges. We did a thorough investigation at each of five pilot locations to understand foot traffic patterns, customer parking, location of available vehicles and amenities within each space. We used this research to inform our signage, kiosk and staff recommendations. Breaking out responsibilities and tasks in each phase allowed us to find the right partners and vendors to help us build the program. We worked with two partners and three vendors in addition to our own internal team of technologists and creatives to build the full program. We learned that our dealer partners were incredibly open to looking at new ways to help customers feel like they were being well-served and respected. Each General Manager invested no small amount into the test-and-learn, to secure and set aside inventory for this effort. 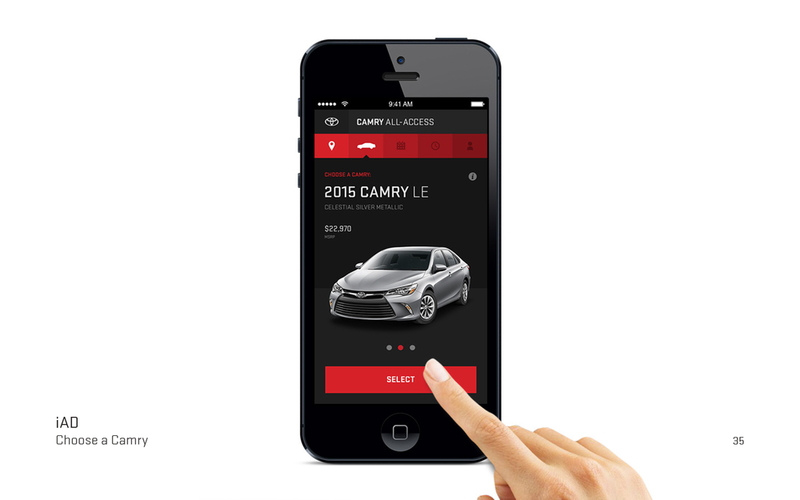 The dealers took to the program and quickly wanted to expand it beyond just Camry to other models. From the customer side, each person who participated in the program loved it. They reported a lack of stress and ample time to explore the vehicle’s features. Those who had not participated continued to voice initial skepticism, asking “what’s the catch?” I hypothesize that this will take continued and sustained marketing effort, word-of-mouth and additional support from all three tiers of automotive advertising to turn the larger tide of user perception.